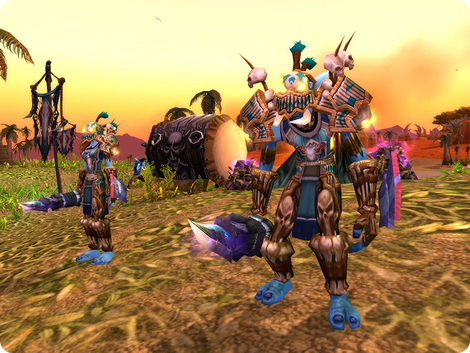 The continuously updated storylines in each new patch of World of Warcraft is best part that can keep players in game. 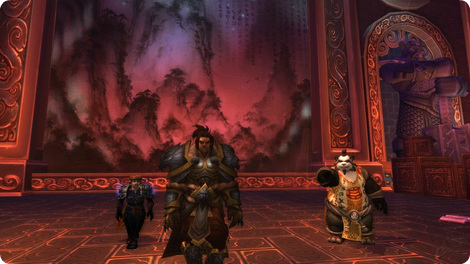 With Patch 5.3 we go further with the storyline and quest chain to the ongoing war between the Alliance and the Horde. While it is a story of the continuing war, it is also a story on the continued deterioration of the Horde as a cohesive force. We have seen the signs for a while now, that Garrosh is taking the war too far and has either lost it mentally or is under some form of dark control. It is possible to see consequences of his madness. 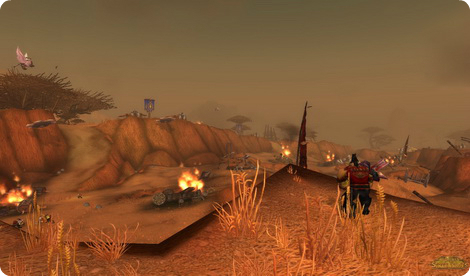 In Patch 5.3 of World of Warcraft, a storyline of the Darkspear Trolls open rebellion against the Warchief was introduced. Yet it is a little different between the two factions the overall idea is the same. In this guide we introduce from the Alliance point of view. This quest in Patch 5.3 needs you teleport to Ratchet from the Shrine of the Seven Stars and then travel to Skull Rock, which is just outside of Orgrimmar. Once there you will meet up with your friends, the SI: 7 crew for some covert operations. For this quest you need to find several pieces of information around the Horde Camp, and free a troll prisoner from the Darkspear clan. The area is heavily guarded though, so there is no way to complete this quest by yourself. Therefore you can disguise yourself as “Project C4T” and make your way through the encampment as a mechanical cat. While you are the cat you can still be seen so make sure you keep away from enemies as much as possible. Also if you are a class that has a combat pet (Hunters and Warlocks) make sure you dismiss the pet first as it will follow the cat and aggro the enemy (or at least it works this way on the PTR server, it may be changed for live release). After gathering all the intelligence, you will be sent to the trolls at Razor Hill. When you near there, wave a white flag so that you won’t be attacked, it is a Horde city after all. The troll you rescued earlier, Zen’tabra, will be there to vouch for you and make sure you get through this part ok.
Zen’tabra now leads you to the leader of the Darkspear trolls to start the next quest. He is in the base of a tower just north west of where you start the quest and also has Chen Stormstout with him. You can get help from Vor’jin at this time, even though you are from the Alliance. He will send you to the Barrens battlefield to prove your loyalty. He needs you to gather 15 of each resource found there and then return to him. 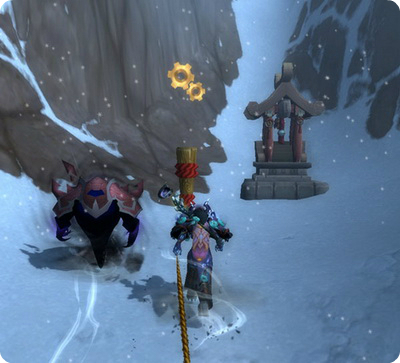 Gather 15 lumber, stone, oil, and meat and then return it to Vol’jin. After the battlefield quest, you will be sent to find the Old Seer Hao Pham Roo, which can be found in the centre of Kun’Lai Summit in Pandaria. Once you find the old seer he will ask for help making his way up the path of the last emperor. This path is a winding path up the mountain that is difficult to pass due to the blowing winds and the elementals guarding it. On the way to your destination there are several checkpoints, which guide the direction of your way while pulling a rope with you. At each checkpoint you need to tie the rope there and allow the Seer time to climb up before you can move onto the next checkpoint. Make sure you clear the elementals along the way before trying to tie off the rope as they will interrupt you if they are not defeated. Once you complete the quest and get the Seer to the top on the mountain he will reward you with an awesome pair of item level 502 boots that should help out most players. Buy if you already have a set of high item level boots, it may be a good time to change your Loot Specialization or to change specs so that you get a set for your offspec. Besides of this, he will also provide a bit of a storyline that explains how pride can cause problems and to remember to always remain open to help from others. An obvious message pointed at the orcs and their current situation.